Yes, this is a picture of my home town, Chenango Forks, NY. The picture was taken on the Fourth of July in the early 1900s. The location is Rt. 12. The second building on the left background is now an antique shop Extra Buttons. 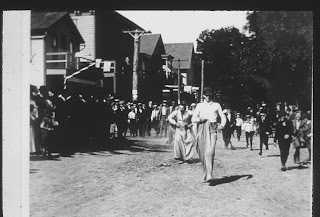 It's hard to imagine a sack race on what is now a heavily traveled road from Binghamton to Norwich. Chenango Forks was once described by a regional author as the 'longest small town (hamlet) in New York State. It runs thru the Towns of Barker, Chenango and Fenton in Broome County and the Town of Greene in Chenango County. The area was settled by John Barker and Simeon Rogers from CT in the late 1700s. It was once a canal town when the Chenango Canal was in operation. Later it became the home of railroaders . Now we are a bedroom community to people working in Greene, Binghamton and the Triple Cities. units today. The living room AC has been bumped down the stairs and is awaiting my pleasure of putting it in the window and fixing the plexiglass above it. First I had to move stuff in the sewing room to get to the AC. I need to go bake a cake. I'm going to try Paula Deen's Blueberry Crush Cake. One day I watched her make this on her show. It sounds yummy. I'll leave a piece for SweetOldBob and take the rest to Donna Lee's covered dish supper tonight. Brick Quilt. I decided to make this quilt queen size.